The following is an excerpt from the NEXT Forecast, an insider’s guide to where the natural products market is now—and where it’s headed. Drawing from proprietary data sets, expert interviews, in-market case studies and the Natural Products Expos, the NEXT Forecast is the industry’s leading source of forward-looking insights. Learn about this and many other in-market trends laddering up to dominant macro forces in this report. We know the juicing trend has skyrocketed, thanks to the wealth of brands that harness high-pressure processing (HPP) for extended shelf life, freshness and, as some argue, preservation of nutrients. But recently, nutritionists are speaking out against juice. The process of juicing—whether at home or in a commercial facility—deposits the vitamins and minerals from produce into your cup. But it also removes all of the fiber and creates loads of fibrous juice pulp that typically ends up in landfills. Smoothies, on the other hand, satisfy consumer desire to eat more fruits and vegetables in a delicious format without the sugar bomb of straight-up juice. Smoothies pulverize fiber, rather than completely eliminating it. And while shoppers have certainly been making smoothies at home for decades, new brands are adding convenience to this category. Supplement companies such as Orgain are launching smoothie boosters with a wide variety of fruit and veggie powders. The newest smoothie boosters are adaptogenic herbs that are powdered and gelatinized (which removes the starch, making them easier to digest). And countless more refrigerated smoothie beverages contain functional add-ins such as probiotics, chia seeds and more. The result: Smoothies have morphed into a food group akin to a multivitamin. 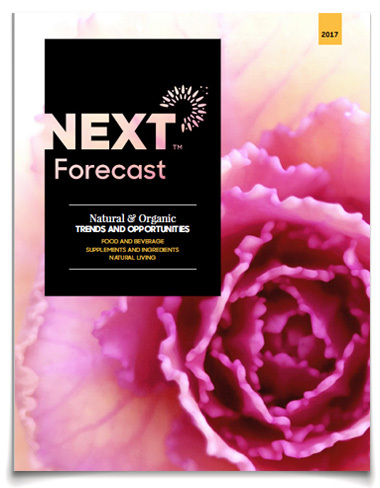 Get the full NEXT Forecast to see how 14 macro forces will shape the future of the natural products industry.